Before Monday’s game, I decided to crown my own champion and have the teams compete in a different way: A Uniform Tournament. I kept it simple. Each team will be assessed based on the uniform they wore in the first round or first game, depending on who wins the First Four matchups. A lot of good in this year’s tourney, a lot of bad, and even some ugly so let’s get right to it. A complete bracket is at the end. A really great start to this Tournament. I personally feel that home whites are a huge advantage, so there could be some bias throughout. 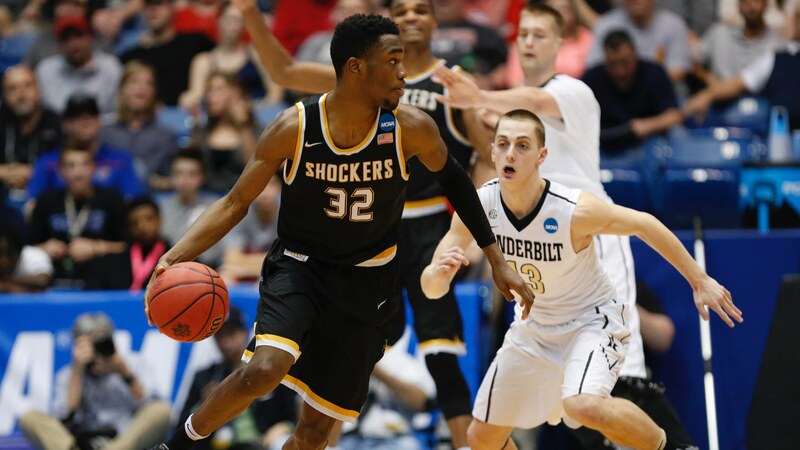 The Shockers updated their uniform this past season and it is a major upgrade. A great base design, but the font may not be the best choice. I really enjoy the Vandy uniforms here, but those shoulder bars are not very pleasing. 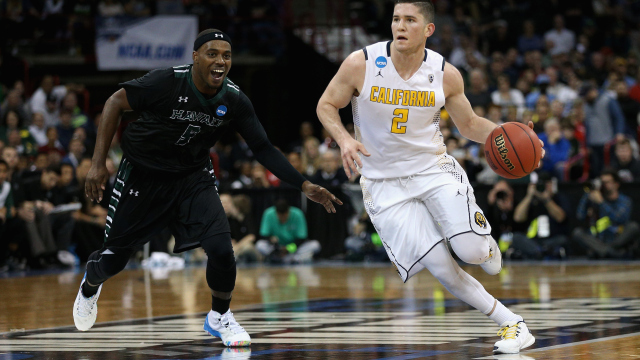 The old­school design of Wichita State takes this one in a close uni matchup. A battle of initials in this one. Usually, I do not like the initialized names, but both of these uniforms are nicely done. Fairleigh Dickinson with those weird shoulder bars does have to deduct some points. 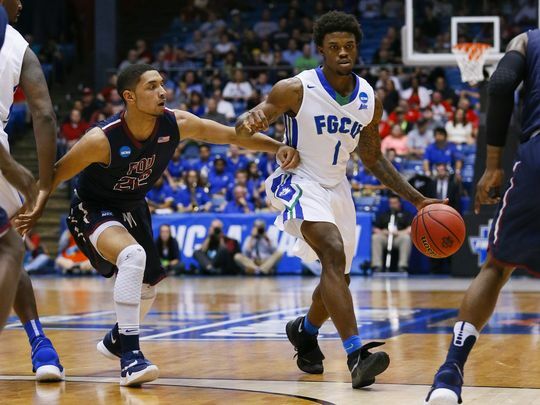 The diamond design on the side panel of Florida Gulf Coast’s shorts is a nice touch and gives them the edge. Another closely contested matchup and it is won by FGCU. And we have our first Adidas school (sigh…). Not impressed with either uniform in this game. Michigan does get bonus points for the yellow, but those tire tracks on the shorts are just awful. 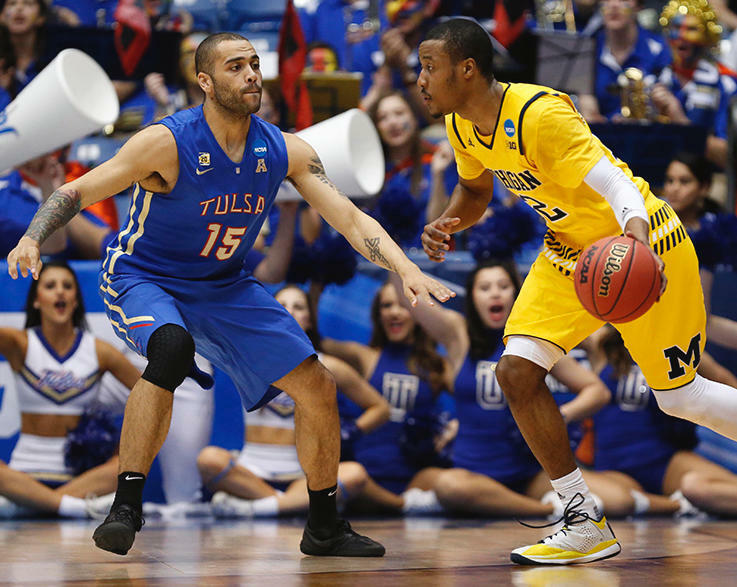 Tulsa’s colors mix so nicely and this pretty basic uniform is a good look. Not the prettiest matchup, but it is won by Tulsa. A matchup that makes me want to barf. Southern’s yellow things are just awful (I know I just gave Michigan credit for yellow, but that’s a different story). Holy Cross’s are just so basic, but that is what Adidas does best now. The purple gives the Crusaders some bonus points and gives them the W.
A pretty good matchup here in the first round. 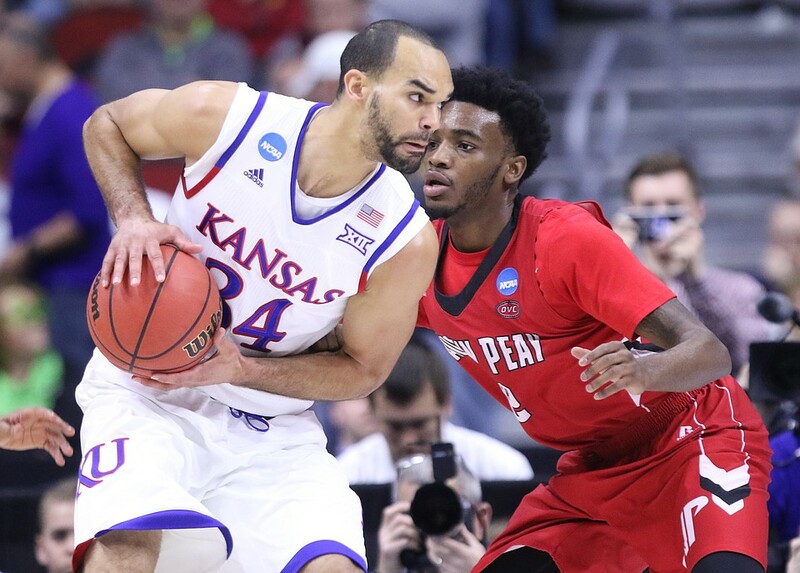 Lucky for the Jayhawks, Adidas hasn’t touched their uniform too much. Austin Peay with a nice showing, but the side panels on the shorts and the atrocious “AP” logo is the nail in their coffin. The timeless uniform of Kansas wins out here. A nice matchup and we see Nike’s redundancy. They are pretty similar in design and it is a little strange to see that the NCAA patches are on opposite sides of the two teams chests. The American flag is bonus points for UConn and gives them just enough to win. Our first look at some Under Armour uniforms in this all Under Armour matchup. I do like South Dakota State’s uniforms here, but unfortunately, they don’t wear their home whites in this one. They also have that strange, squared off collar that deducts some points. Maryland’s are Marylandy and you even love them or hate them. 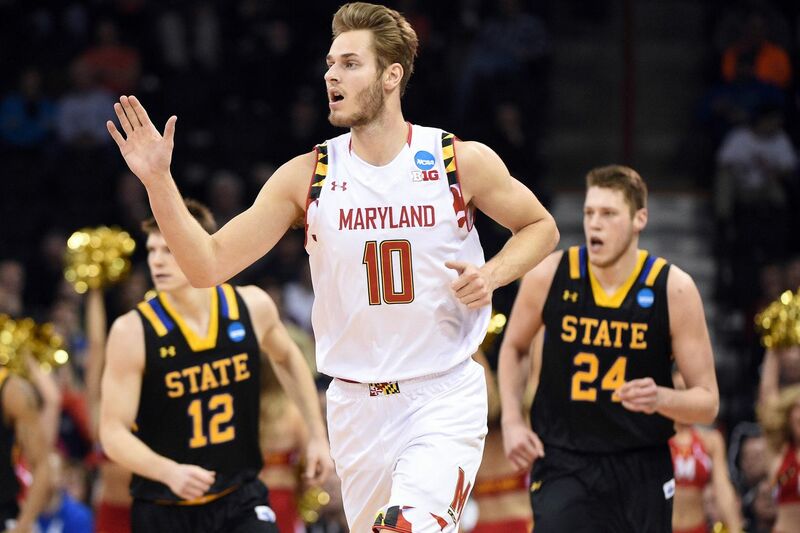 The Terps get the win here, but may not last long in this tournament. A pretty good matchup in this one. Bonus points for Cal’s Jordan brand uniforms and bonus points for Hawaii for their coach’s Hawaiian shirts. Unfortunately, those get deducted because they have the option of using the Rainbow Warrior look and for that, Cal pulls this one out with a very clean look by a hair. We saw Wichita State done these in their First Four matchup and they are just as strong as they were then. Arizona does have a great look going for them and they haven’t really been altered for years now. Kudos to the Wildcats’ consistency and bonus points for the classic Nike Huarache shoes here. The Shockers’ look is going to be very tough to beat in this tournament and that holds true here. Wichita State wins it, in a close one. 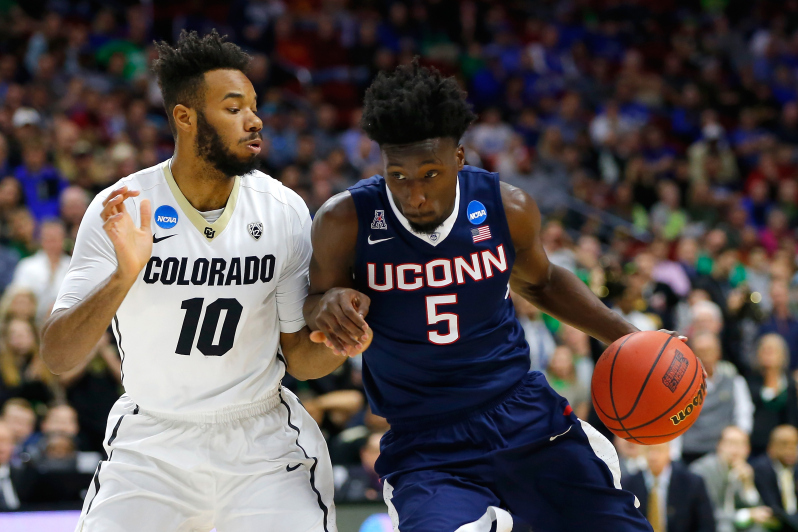 Possibly the worst uniform matchup in the entire tournament. 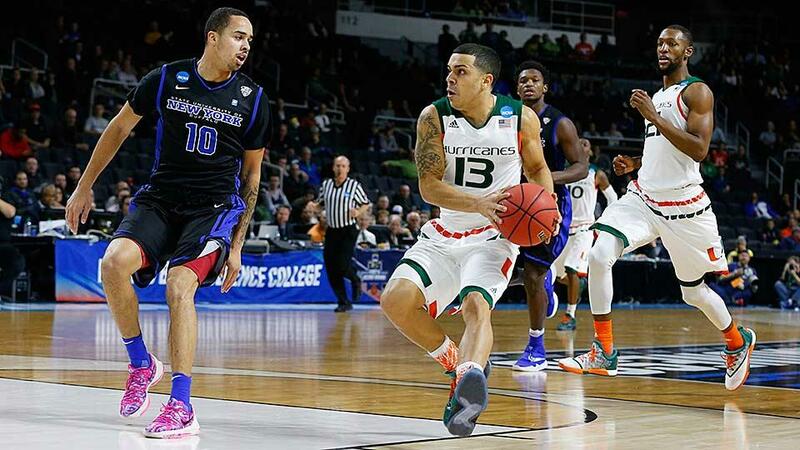 The awful look of Adidas’ tire track shorts for Miami and just awful wording on the front for Buffalo. However, if you remove the top shoulder panels and the tire tracks on the shorts, Miami’s uniforms aren’t that bad. I’ll give them the benefit of the doubt in this one, as it was Adidas’ first go with the Hurricanes in this one. Miami gets the win. A pretty good matchup between contrasting styles. Usually, when it is this close I will automatically side with Nike. Iowa just does not look that great in white, no matter the sport. They also don’t have a Pittsburgh team to base their uniforms off of in basketball. Temple with a great diamond pattern on the band of their shorts and some subtle designs in the shorts is a nice touch. The Owls find a way to pull this one out, unlike the actual game. I’m not sure what I am looking at with UNC Asheville. Just an awful design in their shorts and some terrible vertical wording on the sides. A really poor effort by Adidas, but what did you expect? 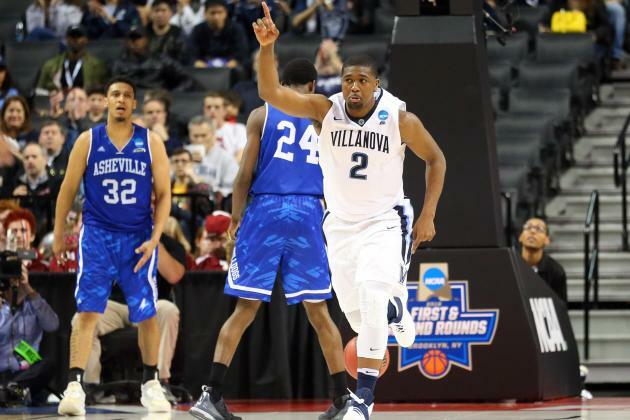 Villanova has such a clean look and it is quickly becoming a contemporary classic in college basketball. An easy victory for the Wildcats in round one. Not an impressive start for Oregon and unfortunately, this is what they will be judged on for the rest of this tournament. 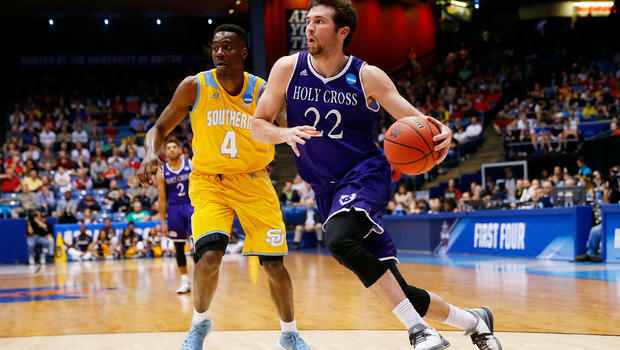 We saw Holy Cross in the first four, and their uniforms aren’t bad, but they are just kind of there. Oregon is able to escape in round one. Not sure how much farther these throwbacks can take them. Not a great matchup, but not a bad one either. 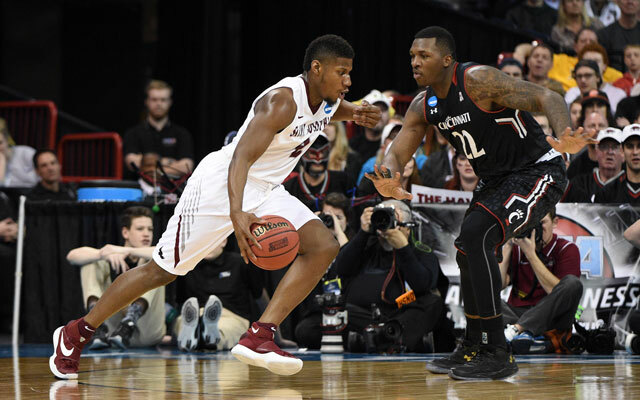 St. Joe’s has a very clean look and Cincinnati is a little busy for my liking, but that is what we have come to expect with Under Armour. I have to give St. Joe’s the edge in this one. We have our first look at some “volt” in our tournament. People either can’t get enough or want to puke. I personally am indifferent, but do not like it for Baylor. 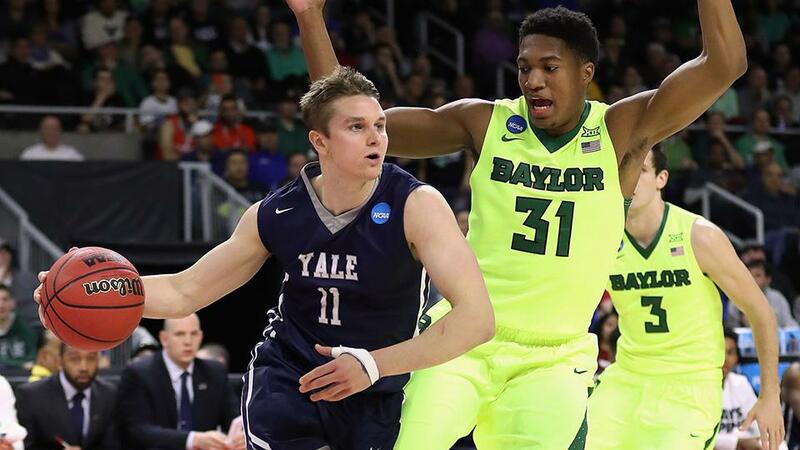 Yale has a pretty simple uniform, but it fits them. This classic look will give them the edge, and they will move on to round two. Duke has had such a classic basketball uniform for years. The last few seasons, I am not sure what exactly they are doing. If it ain’t broke, don’t fix it. 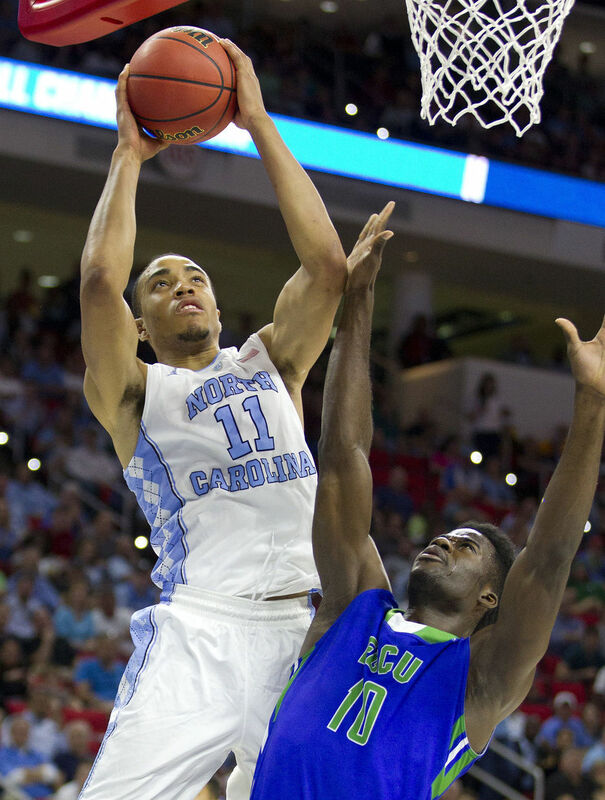 Luckily for them, they face a really bad uniform in UNC Wilmington in round one. They do get by and it will be interesting to see how far this new look can take them. A nice matchup and just like the actual game, it is going to come right down to the wire. 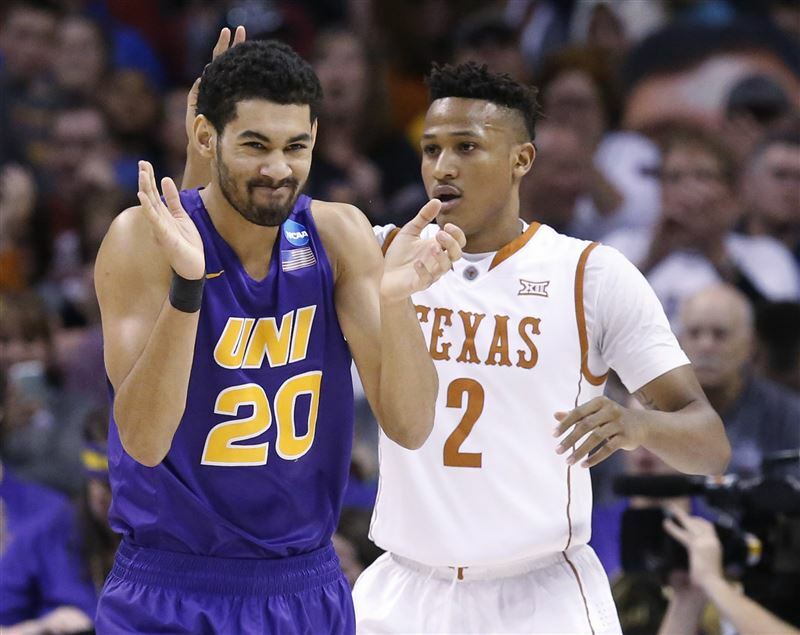 I preferred when Northern Iowa used the full name that went above and below the number. Texas has a very clean uniform and a great font. This look fits them and is able to give them the victory in this one. Not the best look for either school. It is a nice, classic look for Green Bay, but they had to do something special to get past A&M. The Aggies logo gives them the edge, but don’t expect them to make it very far in this tournament. I feel bad for every Adidas school and Texas A&M is a great example, in all sports, that shows why. A solid matchup here. Love the “Beavers” across the chest for Oregon State. VCU’s uniform is pretty bland, but looks very sharp. 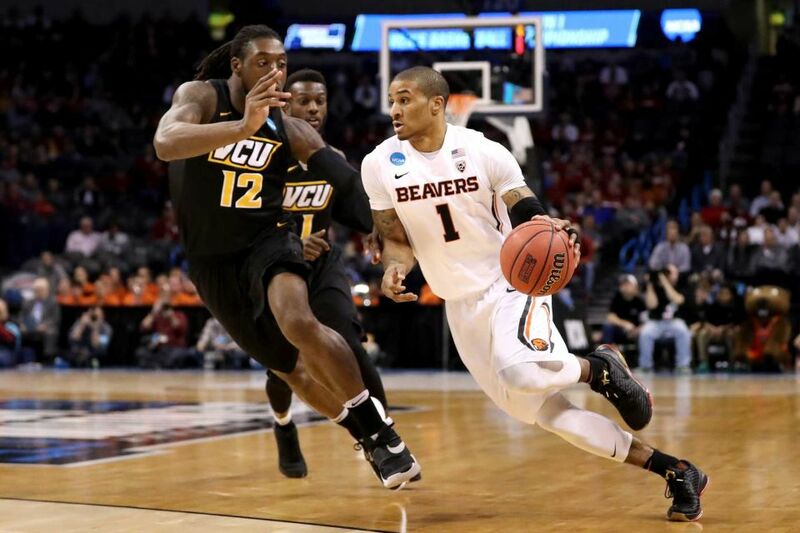 Oregon State does prevail, partially because of their nickname. 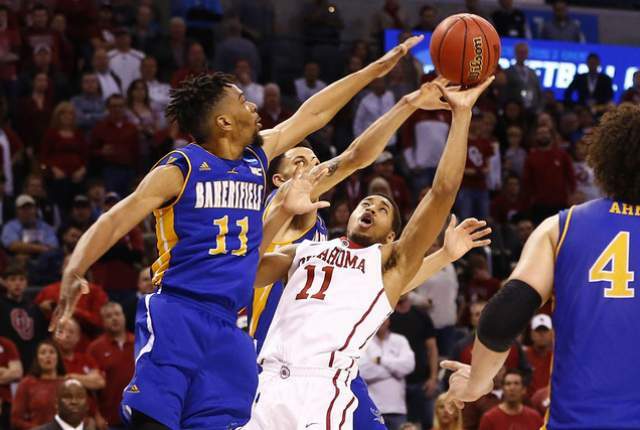 Oklahoma does have a very clean look and CSU Bakersfield’s uniform is not very impressive. The shorts don’t really look like they match the top and with a nickname like the Roadrunners, I was expecting a lot more. Oklahoma wins this one. A very good looking game here. North Carolina has an absolutely timeless uniform, but they get some points deducted because of those black things they wore earlier this year. We saw FGCU in white before, but blue is not as impressive here. The Tar Heels’ argyle and two tiered lettering is tough to beat. No upset here, as UNC wins it. An interesting matchup. 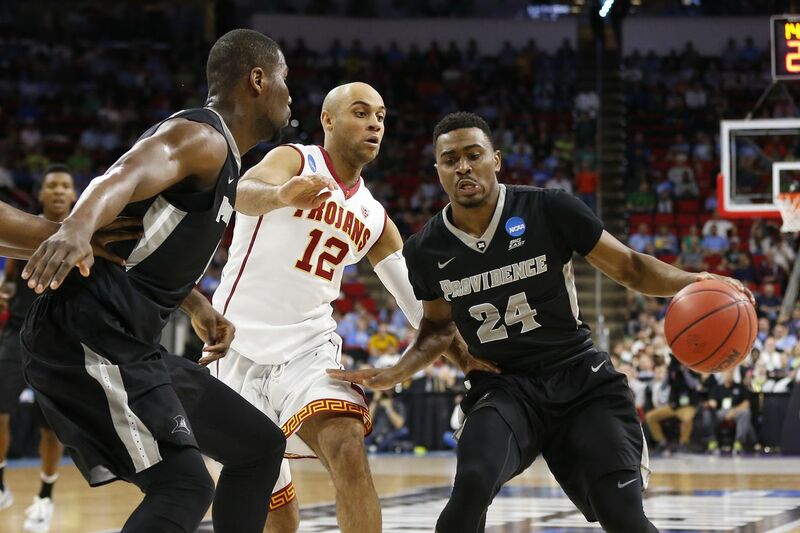 Providence doesn’t have much to work with, with such bland school colors. I am impressed with USC’s look and am pleased that they use “Trojans” on the front instead of USC. A pretty cool design along the base of their shorts too and that puts them over the top. USC wins it. 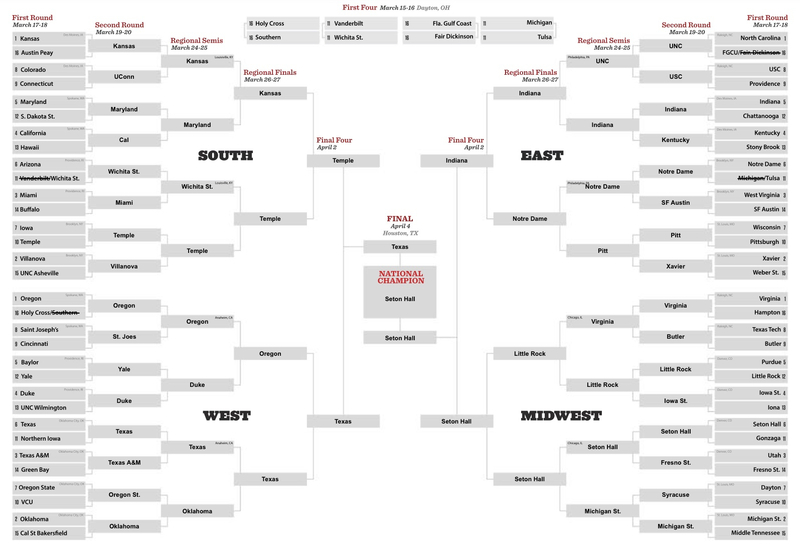 Indiana may have the best overall look in college basketball, but that doesn’t necessarily mean that they win it all. Adidas has once again, and smartly so, let this uniform go (for the most part) and the striped warm up pants add some bonus points. Nothing too impressive from Chattanooga. A pretty common template from Adidas. Not awful, but not enough to take down the timeless Hoosier uni. Indiana wins this one. I was impressed with Stony Brook’s showing in this one. 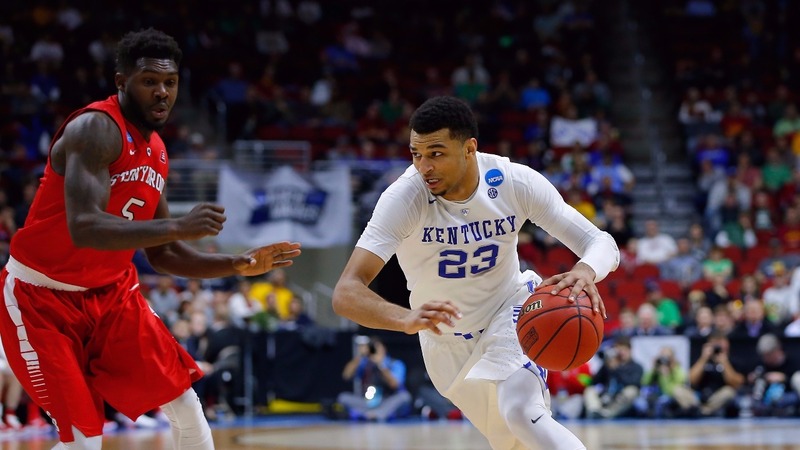 Kentucky has moved on to the new Nike style, in which the top doesn’t cover as much as the usual basketball jersey. It is a tight look and they didn’t change too much to the overall design. I love the checkerboard as well and that gives Kentucky the victory, but closer than expected. We saw Tulsa in the First Four, and they didn’t show anything too impressive. 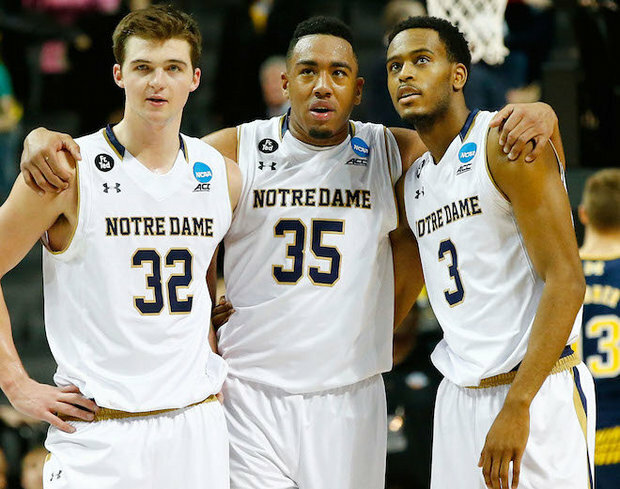 Notre Dame has a great look and it might be Under Armour’s best. The white is very clean and it is good to see them get away from the gold for a little bit. They do win this one, fairly easily. Not overly enthused about this matchup. West Virginia has a clean, but pretty bland look. I was impressed with Stephen F. Austin’s look and they get bonus points for the purple. 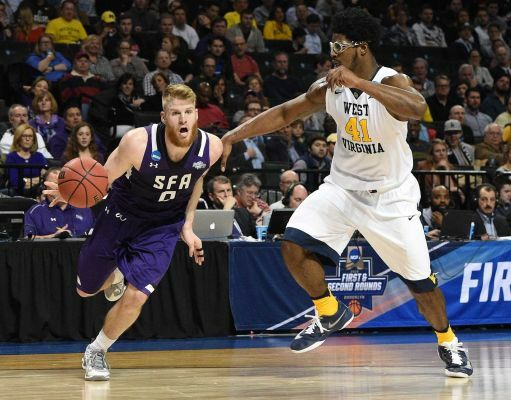 Not enough from the Mountaineers so a surprising victory, just like the actual game, for SFA. Not a great matchup here. Very ugly shoulder panels for Wisconsin and those weird stripes on the base of Pitt’s shorts. When in doubt, Nike beats out Adidas every time and that’s what happens here. Pitt wins. Nothing special about this matchup. It is pretty closely contested but something that may go unnoticed, the big “X” as the design on Xavier’s shorts is a huge plus. 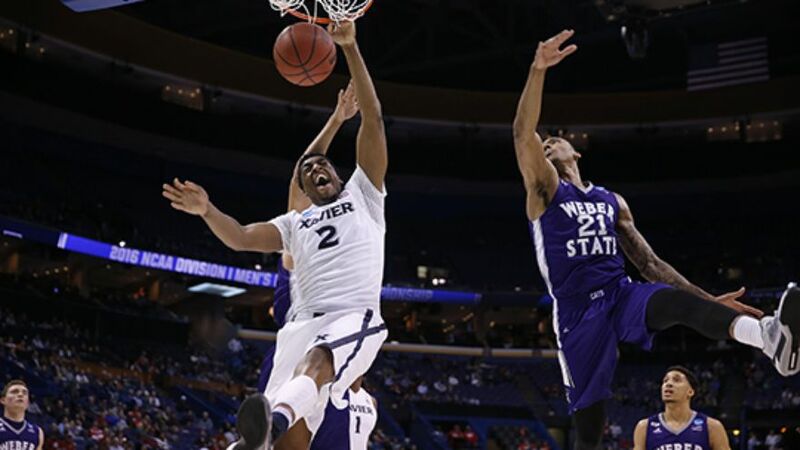 Weber State doesn’t bring much to the table in this one, so Xavier gets the win. Nothing too special here. 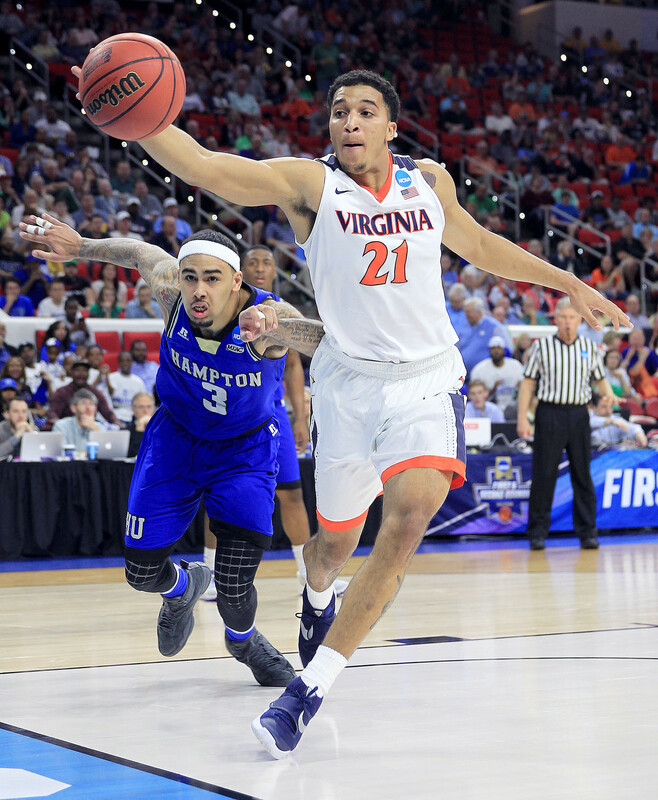 A very clean look for Virginia and it is just too much to handle for Hampton. Not much Russell Athletic can do to beat Nike. The Cavaliers win this one, pretty easily. Once again, nothing much happening here. Butler has a very solid look and Texas Tech is right there with them. 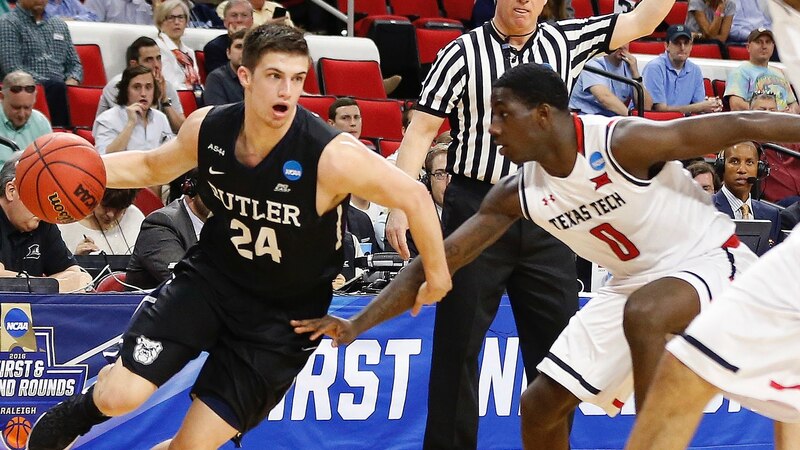 I love the bulldog logo on the shorts for Butler and that gives them enough to win this matchup. Strong uni matchup here. 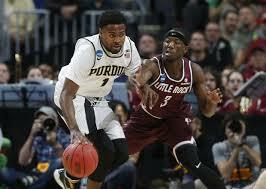 Bonus points for Purdue for going with the Throwbacks, but might not be the best time for them. Little Rock came in strong with a very clean look and a font that fits them nicely. I am really torn here and think that I have to hand it to Little Rock. They win the game and the uniform battle. Strong look and similar color schemes here. 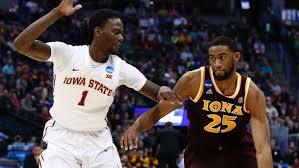 The shoulders aren’t exactly big enough on Iona’s tops for that NCAA logo, but that isn’t really their fault. Iowa State has a very clean look and you can’t really complain about it. I’m not big on Iona’s font so Iowa State holds on here. A very good matchup here. Seton Hall gets huge bonus points for these clean classics. Gonzaga is in trouble because their home whites are much better looking than these. I am a big fan of their look though. The font of Seton Hall’s lettering is just phenomenal and gives them the egde. A pretty solid matchup in this one. I am very impressed with what Fresno State brought to the table. 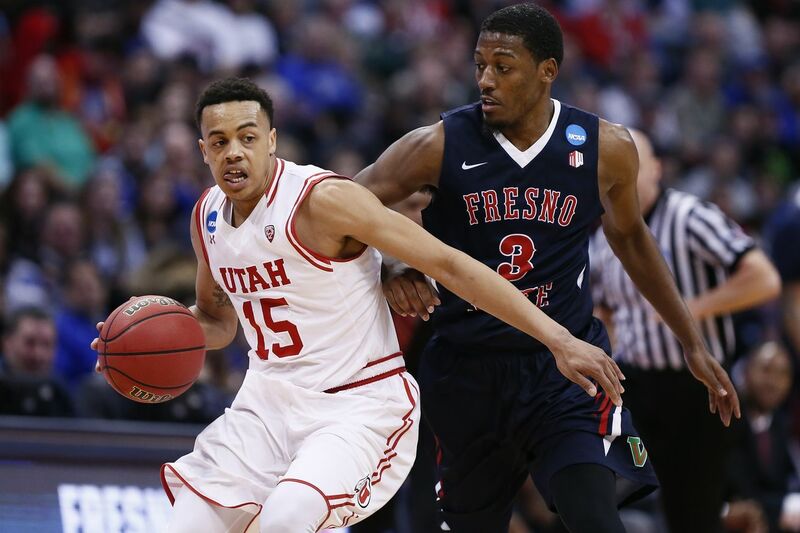 Utah has a nice look, but not sure that this home white is their best. Fresno State pulls the upset with a very sharp look. Unfortunately, Syracuse altered with a classic. Dayton with a strong look, but I’m not sure it’s enough. 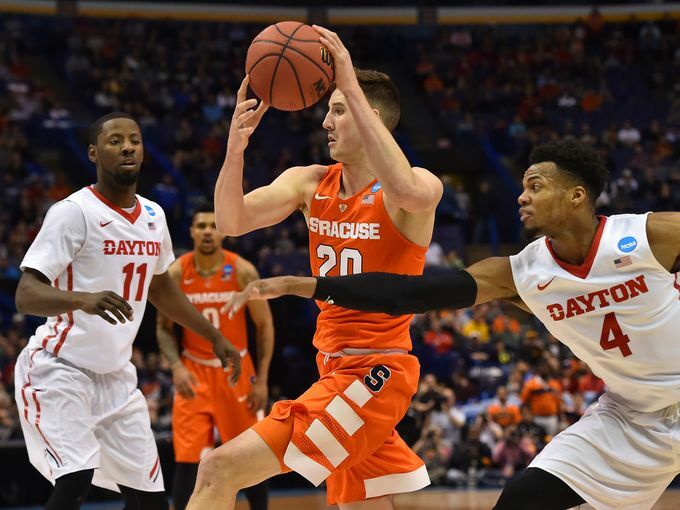 I will give Syracuse this one because they have had some of the best unis in the past, but they probably won’t last long. Our final first round matchup is a good one. Michigan State loses points for those absolutely awful lime green things they wore earlier this season, but this throwback look redeems them. 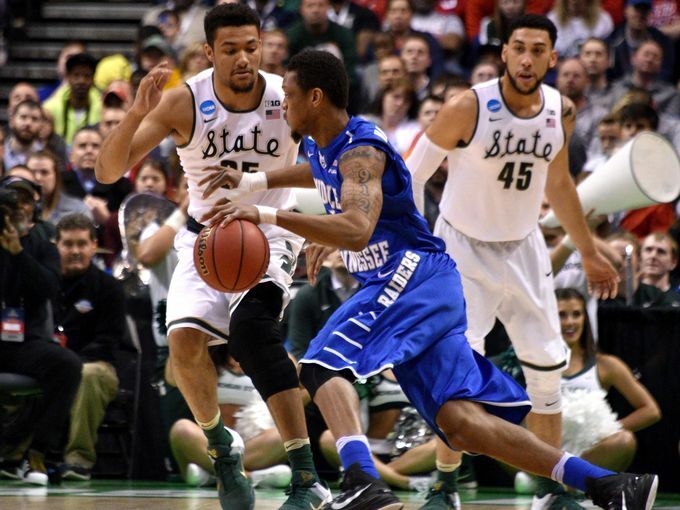 Love the look and the Spartans advance. The classic look of Kansas keeps them moving on. Not too thrilled about either, but the state pride of Maryland will give them the advantage. Miami just squeaked by in the first round and Wichita State is very impressive. They win easily here. A great looking battle between these Philly schools. I just love those diamonds on Temple’s waistband and I will ride that as far as it will take me. Temple wins a close one. The bland look of St. Joe’s isn’t enough to take down Oregon, even in their throwbacks. Nothing special happening here. Yale’s are not enough though, even for these ugly Duke unis. Texas wins this easily. No questions asked. A good looking matchup between two Nike looks. Oklahoma by a hair with their clean look. Two good looks but UNC just too much. Tar Heels move on. A classic matchup but the Hoosiers definitely win this one. A battle of Under Armour schools that is one by the sharp looking Irish. A tough one to call, but Pitt pulls the upset and wins this one. Nothing special here, but the sharp looking home whits of Virginia wins it. In a surprise to most, Little Rock has the better look here and they move on. Seton Hall’s uniform is just too impressive. They win this matchup. The script font for Michigan State is just too sharp and it’s an easy win for the Spartans. A classic up against a very futuristic uniform. Classics always prevail and so do the Jayhawks. A tough one to pick, just flip a coin for this one. I love the Shockers new look, but Temple is moving on. Not impressed with either. I guess I will have to go with Oregon. This is probably the weakest region in the field. The good old Red River Rivalry. A sharp looking matchup between two clean looks. Texas and the contemporary classic look take the cake here. This one may be too close to call. Two pretty classic looks, but I guess I have to go with Indiana. It pains me, but the warm up pants give them the edge. An matchup easily won by Notre Dame. Cinderella advances here. Little Rock to the Elite 8. A very good looking matchup, but I’m riding that Pirate Ship. Seton Hall advances. Such a tough one to call. Temple, in my eyes, does have the better overall look. If Oregon wouldn’t have worn those throwbacks in the first round, they could win it all, but Texas goes on to win this one. Another good looking matchup. Indiana is going to ride that classic look all the way to the Final Four. 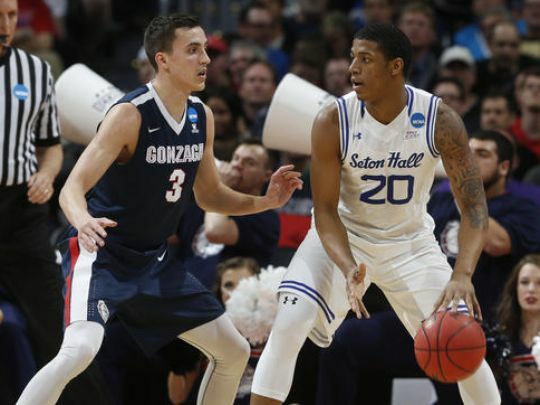 Cinderella’s run ends as Seton Hall goes to Houston. When this journey began, I really did not expect to see these two here. Both with solid jersey’s and the Longhorns move on. Texas’ with that old western font is just too much. Even for that diamond waistband of Temple. 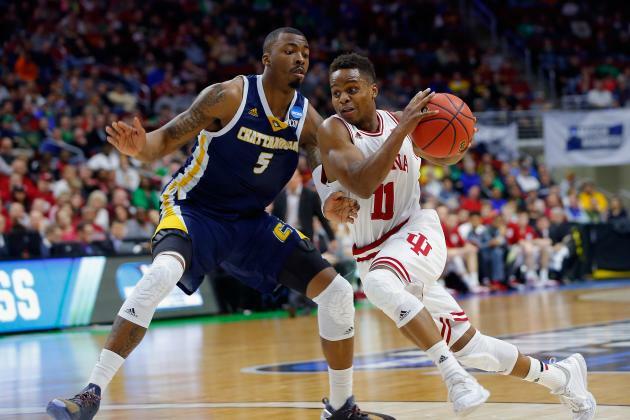 I have been complimenting Indiana this whole tournament on their classic look. However, they were just outclassed by Seton Hall. The Pirates are into the final. Congratulations to both teams for rocking some great gear all year. Texas has been phenomenal, but Seton Hall with such a clean and classic look. The Pirates are the 2016 Men’s NCAA College Basketball Uniform Champions! Do you agree with these picks? Let us know what changes you would make and fill out your uniform bracket while you are waiting for the Sweet 16. We’d love to have you share them with Student Union.